Semtech Corporation (Nasdaq:SMTC), a leading supplier of analog and mixed-signal semiconductors, today announced the initial production release of a highly integrated chipset for next-generation 100G QSFP28 modules used in data communications applications. 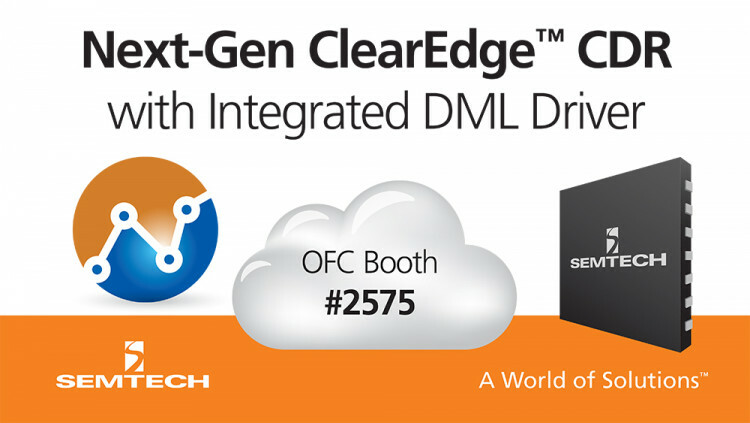 Semtech will privately demonstrate the new chipset in its OFC booth (#2575) at the Los Angeles Convention Center March 21-23. The new chipset includes GN2105, a quad ClearEdge™ CDR with an integrated DML driver for DC-coupled chip-on-board and passive transmitter optical sub-assembly applications, and GN2110, a quad ClearEdge CDR with integrated transimpedance amplifier (TIA) in a compact 3.6mm x 4mm die for chip-on-board applications. The highly integrated chipset is specifically tailored to customers’ needs and provides overall cost savings for high-performance, low-power modules. Semtech’s optical networking product portfolio includes integrated chipsets for reduced cost and robust feature sets that maintain signal integrity while supporting scalable data rates for a broad range of applications. Learn about Semtech’s optical networking products: www.semtech.com/optical. Contact Semtech’s customer service team for technical support or general product inquiries. Sign up for Semtech’s e-newsletter Inside Circuit for quarterly product updates. Follow Semtech on Twitter, Facebook, LinkedIn, and Google+. Semtech’s optical networking products provide high-performance signal integrity for optical module solutions used by leading companies in the data center/enterprise networking, wireless infrastructure, and passive optical network/Fiber to the X markets. For more information, visit www.semtech.com/optical. OFC includes dynamic business programming, an exhibition of more than 600 companies, and high impact peer-reviewed research that, combined, showcase the trends and pulse of the entire optical networking and communications industry. OFC is managed by The Optical Society (OSA) and co-sponsored by OSA, the IEEE Communications Society (IEEE/ComSoc), and the IEEE Photonics Society. OFC 2017 will be held from 19-23 March 2017 at the Los Angeles Convention Center, California, USA. Follow @OFCConference, learn more OFC Conference LinkedIn and watch highlights OFC YouTube. Semtech Corporation is a leading supplier of analog and mixed-signal semiconductors for high-end consumer, enterprise computing, communications, and industrial equipment. Products are designed to benefit the engineering community as well as the global community. The Company is dedicated to reducing the impact it, and its products, have on the environment. Internal green programs seek to reduce waste through material and manufacturing control, use of green technology and designing for resource reduction. Publicly traded since 1967, Semtech is listed on the Nasdaq Global Select Market under the symbol SMTC. For more information, visit www.semtech.com. All statements contained herein that are not statements of historical fact, including statements that use the words “will,” “enables,” “designed to,” or other similar words or expressions, that describe Semtech Corporation’s or its management’s future plans, objectives or goals are “forward-looking statements” and are made pursuant to the Safe-Harbor provisions of the Private Securities Litigation Reform Act of 1995, as amended. Such forward-looking statements involve known and unknown risks, uncertainties and other factors that could cause the actual results of Semtech Corporation to be materially different from the historical results and/or from any future results or outcomes expressed or implied by such forward-looking statements. Such factors are further addressed in Semtech Corporation’s annual and quarterly reports, and in other documents or reports, filed with the Securities and Exchange Commission (www.sec.gov) including, without limitation, information under the captions “Management’s Discussion and Analysis of Financial Condition and Results of Operations” and “Risk Factors.” Semtech Corporation assumes no obligation to update any forward-looking statements in order to reflect events or circumstances that may arise after the date of this release, except as required by law. Semtech and the Semtech logo are registered trademarks or service marks of Semtech Corporation and/or its affiliates. Third-party trademarks or service marks mentioned herein are the property of their respective owners.